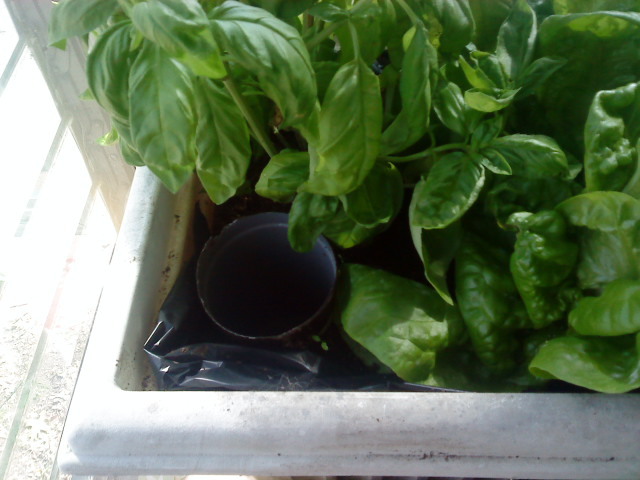 A friend at Hyperlocavore (an interesting and informative site — check it out: http://hyperlocavore.ning.com/) introduced me to sub-irrigated planters (SIPs, an apt acronym, as will become clear). Basically, when putting together your raised bed, window box, or any other enclosed planting system (sans drainage), you start by lining the bottom with a system of enclosures with small openings that will hold water and allow it to seep slowly into the soil from below. This reservoir is filled through a vertical tube, open at the top of the planter and secured in a small entry to the reservoir. SIPs can range from very sophisticated — raised beds with pvc pipe, for instance — to very simple — a milk jug cut in half with the top portion turned upside down and sitting in the bottom. Here is a flickr site with many great photos of a variety of SIPs: http://www.flickr.com/photos/greenscaper/sets/72157624321548672/. SIPs serve several purposes. As the water seeps into the soil, your plants’ roots stay hydrated at all times without being overly saturated. Your plants, therefore, get just the amount of water they need; the soil SIPs the water — get it? Uh, anyway, the water lasts much longer, as there is virtually no surface evaporation, so you save money and aid the environment. This also leads to greater advantage from rainfall and fewer hours spent dragging and aiming the hose. Win-win-win! 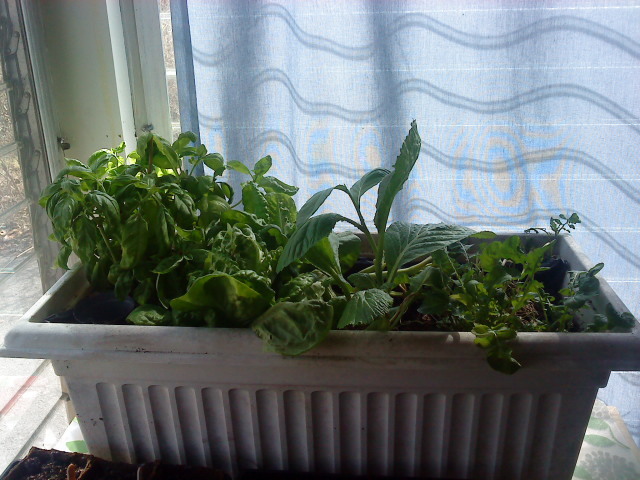 I bought these plants at the winter farmer’s market. Essentially, they were just a few stems and leaves with the roots attached. What you are seeing is after a mustard and arugula harvest, so the right side of the picture doesn’t do justice to this SIP’s prolificacy. Sub-irrigation access tube: an empty hydrogen peroxide bottle! I found the planter next to a neighbor’s trash can last fall. I lined it with a trash bag because the previous owner had already drilled drainage holes. The reservoir consists of a few of those plastic containers that hold individual plant starts at the gardening store — very convenient, as they already had slits in the bottom. I cut a hole to accommodate the neck of the peroxide bottle (bottom removed), jammed it in there, added soil, water, my itty bitty plants, and behold: a compact but productive indoor garden! I add about 1 – 2 cups of water each week, which appears to work. The soil on top always feel just damp, but never saturated. We will repeat this process on a grander scale in Rousseau’s garden. I will take photos as construction takes place and share them with you soon.